Early MacBook Pros Hit by Battery Glitch? "Stanford Law Professor Lawrence Lessig has started an excellent discussion on the Apple Discussion forums about the lack of a good airplane charge solution of the MacBook Pro. It looks like Apple needs to take some action on this issue or risk losing a lot of frequent flying potential MBP sales." "Apple has apparently added battery problems to the list of woes potentially affecting its MacBook Pro notebook family. Online reports allege a small number of early versions of the Intel-based machines may have shipped with troublesome batteries. Apple is said to be replacing the power units on a customer-by-customer basis." Link: Early MacBook Pros Hit by Battery Glitch? "There is now a way to read the internal temperature of the MacBook Pro, something no other software has been able to do to date. A creative developer has figured out a way to get data from the internal monitors via a kernel extension (kext)." "If your battery gets low when using an application that fills the entire display on a portable Mac (that is, the Mac OS X menu bar is not visible), you will not see the low battery alert warning. 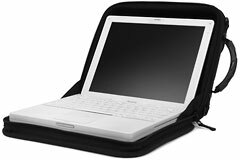 This article applies to Mac OS X 10.2 or later on an iBook, PowerBook, or MacBook Pro computer. "When this happens, your built-in keyboard and trackpad may become unresponsive. "Simply connect your computer to an AC outlet to recharge the battery. If your AC adapter is not handy, connect an external keyboard and mouse to your computer to see and dismiss the low battery alert (after which your built-in keyboard will work)." PR: Daystar Technology has expanded its offerings for the award-winning XLR8 MAChSpeed G4 Upgrade Series. Effective today, Daystar has expanded its new line of PowerBook G4 Aluminum CPU upgrades to include the popular 12" PowerBook G4. Daystar has also added low-power choices, restructured pricing, and now includes free shipping. New 12" PowerBook Upgrade Options. The new MAChSpeed G4 Upgrade for the 12" PowerBook allows any 12" Aluminum PowerBook (1.0 GHz or above) to be upgraded to the latest 1.67 GHz speeds. The upgrade doubles the size of the internal cache on the early PowerBooks, and also delivers up to 60% more speed. Like other XLR8 PowerBook CPU upgrades, the 12" version is factory installed by Daystar's Apple Certified Technicians. 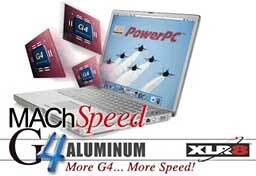 The PowerBook Aluminum upgrades are now available in a variety of speed options. The lower speed 1.67-1.75 GHz options allow users to make substantial jumps in performance without sacrificing cool running or longer battery life. The 1.92-2.0 GHz options deliver extreme desktop-alternative performance and require AC power to achieve maximum speed with heavy workloads. These high-end upgrades easily surpass the Intel-based Macs in non-Universal Binary applications like Photoshop, XPress, Flash and Premiere. 3-Way Shipping Included . . . Free. Free US Ground shipping is now included. 3-way 2-day, 3-way overnight and Daystar's Weekender service are available at an additional cost. 3-way shipping, all parts, labor, testing and detailing is included. Easy one step ordering is available online. Additional information on Daystar Technology and XLR8 can be found via the Daystar website. Daystar Technology's Gary Dailey tells me that Daystar/XLR8 is putting the finishing touches on a new line of Titanium PowerBook processor upgrades. They will be announcing product for the Titanium DVIs first (1.33 GHz upgrades), and are testing the solutions for the VGA (550/667) and the higher end (867/1 GHz) TiBooks as well. PR: FastMac has announced it has begun shipping TruePower laptop batteries for the PowerBook G4 Titanium. The TruePower Titanium battery is priced at $99.95 and offers up to 48% more capacity than the original. All customers that placed preorders through the company's website will receive their shipments in the next few days. FastMac offers a variety of high-quality and high-capacity batteries for: PowerBook G4 Aluminum (all models), iBook (all models), and PowerBook G3/(WallStreet, Lombard, and Pismo). The TruePower batteries start at an introductory price of $99.95 and offer up to 56% more capacity than the original. Select models including the PowerBook G4 Titanium are now shipping. The TruePower batteries are engineered using the highest quality, highest capacity Lithium cells available. FastMac utilizes custom form factors and materials to achieve a superior fit and finish, matching the original battery while increasing capacity. Each battery is individually tested and includes safety features to protect against overcharge, short circuit, and power surges. All TruePower laptop batteries come with a 1-year warranty and 30 day money back guaranty. PR: Newer Technology has released a new high-capacity lithium-ion replacement battery for G3 and G4 12" iBooks. Listen, watch and play longer between recharges with up to 50% more capacity. Make your PowerBook or iBook even more powerful by replacing the original battery or adding a spare. All Batteries are brand-new with 1-year NewerTech Warranty. PR: NitroAV.com, a leading developer and manufacturer of FireWire 800/1394 hardware peripherals, storage and RAID subsystems, announces the "ExpressWay Series" 34mm FireWire 800 Express Card Adapters. An industry 1st FireWire 800/1394b 34mm Express Card - the "ExpressWay Series". This new FireWire 800/1394b 34mm Express Card allows you to easily connect your FireWire 800 peripherals to your ExpressCard slot. 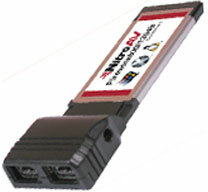 ExpressCard technology is different than PCMCIA because it has an increased transfer rate and better efficiency between the computer and external peripherals. The first in an upcoming line of 34mm Express Card adapters, the "ExpressWay" series brings its ($89.95) 2-port FireWire 800/1394b Professional Express Card (34mm) FireWire 800 Adapter (2 9-pin Connectors), which provides an easy and affordable way to add FireWire 800 storage and devices to your Express Card-supported laptop or desktop computer. It's a perfect fit for Apple's newest laptop, the MacBook Pro, which supports only 34mm Express Cards, but the sleek card also works perfectly with 54mm slot from vendors like Dell and HP laptops. PR: If you want to add some color to your MacBook Pro experience, ColorWare will be happy to give your laptop a color makeover, or to sell you a brand new MacBook Pro in your choice from their selection of custom shades (five solid colors and 18 metallics) in the company's proprietary X2 scratch-resistant, UV-resistant coating material, at about $650 more than the regular retail price. PR: Targus Inc., maker of the world's best-selling notebook cases and accessories, introduces four new notebook backpacks designed to meet the needs of different lifestyles, personalities and needs. Each style features a padded notebook section that accommodates screen sizes up to 15.4 inches, mesh lined shoulder straps and padded back panel for added comfort, and a convenient carry handle. "Backpacks are the fastest growing category in the notebook case industry," said Michael Greco, director, U.S. product marketing for Targus. 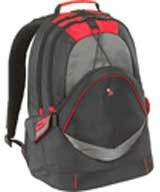 "No longer does the notebook backpack cater solely to a younger demographic. With more of corporate America shifting toward a casual dress code, the backpack is growing in acceptance and popularity for many workers. 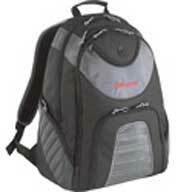 Targus' latest backpacks have the versatility to meet the needs of students and professionals alike." The Repel Backpack is loaded with comforts for those who travel long distances. Featuring a trolley pass-through for easy attachment to a rolling piece of luggage, the Repel offers a tuck-away sternum strap, ergonomic shoulder straps, and an integrated carry handle. 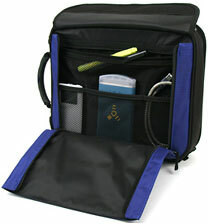 The front pocket workstation includes storage for pens, a cell phone or PDA, a mesh compartment for additional notebook accessories, as well as a retractable travel document holder and a nyflex-lined CD/MP3 pocket with a line-out headphone port. Available in black with red and gray accents, the Repel is constructed of nylon, measures 15" x 18" x 7.4" and weighs 3.52 lbs. MSRP is $69.99. Offering multiple interior and exterior storage solutions, the Ricket Backpack is ideal for the student or frequent traveler. The interior workstation features pen/pencil loops, a business card/ID holder, pockets for additional notebook accessories, a CD pocket and line-out headphone port. Ricket sports a mesh water bottle holder on each side, and the front pocket features compression straps designed to carry a jacket, sweater or additional file folders. A cell phone pocket is attached to the backpack strap for easy access. Constructed of gray ripstop nylon with black accents, the Ricket measures 13" x 17.7" x 8.2" and weighs 3.3 lbs. MSRP is $49.99. The Drifter Backpack is stylish enough for the student and functional enough for the working professional. Black with red and gray accents, the Drifter's front pocket workstation features a compartment for a cell phone or PDA, pen/pencil loops, and a zippered section to store files and extra supplies. Velcro pockets on each side provide additional storage, and the bungee cord in front is ideal for carrying a jacket, sweatshirt or sweater. Constructed of nylon, the Drifter measures 13.5" x 7.6" x 17.3" and weighs 2.42 lbs. MSRP is $49.99. The Rogue Backpack features a seven-pocket design, offering plenty of storage for all essential mobile devices and personal accessories. The front zippered pocket is suitable for personal items, and the middle zippered pocket features pen loops, a business card/ID holder, and a mesh pocket for notebook accessories. The notebook section offers a mesh pocket as well as a zippered nylon pocket that is accessible from the outside of the backpack, and zippered pockets on each side of the Rogue offer additional storage. 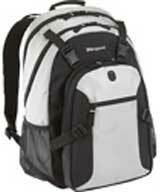 Other features include a nyflex-lined pocket for an iPod or CD player with line-out headphone port, and a removable cell phone holder on the backpack strap. Constructed of polyester and available in black with charcoal accents, the Rogue measures 14.5" x 18.5" x 7.6" and weighs 2.2 lbs. MSRP is $39.99. 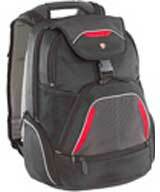 All Targus backpacks come with a limited lifetime warranty. PR: Satchels to hug your small, big or biggest lappies and like fluff-free tights, they're hard on the outside, with a prefect-like zip guard... Lightly padded, semi-rigid, zip-up, work in/work out, protective laptop computer clamshell clutch case, tailor made for Aluminum & Titanium PowerBooks. 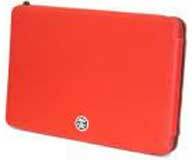 Shuttle Laptop Sleeve 12" and 15"
Everything you need in a compact sleeve and nothing more. The Shuttle provides full-time protection plus efficient organization for the growing number of laptop users who appreciate the advantages of a compact carrying case. Elegant simplicity combined with full-time protection. PR: UnPlugged is an application to notify when the power cord of the Mac is unplugged or plugged in. Notifications are done using Growl, or with a Alertwindow, when Growl is not installed. This App is done with Cocoa and doesn't use as much RAM and CPU usage as the other tools available. unplugged will show the battery status every couple of percents that the battery looses capacity, you can change this in the prefpane. PR: We have been working on a software solution to control in a "better" way the Core Duo processor of the MacBook Pro and to eliminate the whine noise. We did a initial tool to eliminate the noise, this tool just work to activate the C1E state and send a HALT instruction when the CPU is idle. This eliminate the noise, but make the system unstable when come back from standby. SpeedIt kernel extension current public version only support reading of temperature and CPU frequency. The CPU temperature reading is valid for MacBook Pro, iMac Intel and mini Intel. SpeedIt kernel extension current development version support cpu_frequency selection. To look for a solution, Cryptonome started to debug the kernel and to look about how OS X did to control the CPU, well I discovered several things. OS X left to the processor to control the STATE of itself, yes he CPU is auto controlling his power requirements. OS X did not implement yet any Thermal monitoring for the CPU, this is not mind that there is not Thermal monitoring but the processor manage it. OS X did not Implement as FreeBSD, OpenBSD or Linux CPUFREQ, ok was not needed and perhaps OS X did not need it, but should be good to have it. OS X did not manage the kext DynamicSpeed, simply is there but exit immediately because the kernel did not implement the processor speed/voltage directives and have not the indicator of this functionality. OS X ACPI did not implement yet a total control of the subsystems. If you want and in deep explanation ask me, here is not only OS X, the EFI+ROM have a lot of to do. OS X AppleThermal Kext did not work on MacBook Pro. What I was doing the last too weeks, first manage to install Linux and windows to understand how the hardware is working. Making some work a t IOKit level and direct kernel extension levels. What is the elegant solution, implement a real cpufreq as a kernel extension, is what we're doing right now. This will solve several issues and will allow a better CPU speed control inside OS X. We think that Apple is doing the same, this will be a waste of time but we'll do it because we can. System requirements: Intel Mac. Tested on MacBook Pro at 1.83 GHz, MacBook Pro at 2 GHz, Mac Mini and iMac. The multiplying effects of computers, the Internet, and education can double the reach of technology's benefits worldwide in the next 5 years, Intel Corporation President and Chief Executive Officer Paul Otellini said in a speech at the World Congress on Information Technology. "We're close to achieving Andy Grove's vision of a billion connected PCs - and the economic, social and personal gains that come with them," said Otellini, referring to the Intel cofounder and former CEO. "Our job now is to harness the combined potential of full-featured technology, high-speed connectivity and effective education to speed the gains for the next billion people - and the next billion after that." In his speech, Otellini said that the predictions by Grove and of another cofounder of Intel, Gordon Moore, form a backdrop for the new World Ahead Program from Intel. The program's 5-year goals are to extend wireless broadband PC access to the world's next billion users while training 10 million more teachers on the effective use of technology in education, with the possibility of reaching another 1 billion students. "Moore's Law and volume economics made PC technology broadly accessible, and Andy understood the tremendous additive force of the Internet," said Otellini. "But this power is still out of reach for most of the world's people. The World Ahead Program, which integrates Intel's efforts in accessibility, connectivity and education, seeks a multiplier effect to accelerate the next wave of gains." Otellini demonstrated one of the PCs developed from Intel's extensive ethnographic research in developing countries, a small notebook PC for students code named "Eduwise." Eduwise is specifically designed to provide affordable, collaborative learning environments for teachers and young students. Otellini also announced that Intel and the Mexican government have reached an agreement to make Intel's new low-cost, fully featured PC available to 300,000 teachers by year's end. The systems, unveiled last month in Mexico by Otellini as part of Intel's Discover the PC initiative, provide an easy-to-use, fully functional PC for first-time users. Intel also plans to extend teacher training to 400,000 teachers in Mexico through the Intel Teach to the Future program by 2010. "The federal government of Mexico has made great progress in bringing computing into the primary and secondary school classrooms of our country," said Mexican President Vicente Fox. "Now we can take a big step to effectively bring computing into the classroom by allowing teachers to immerse themselves in computing in their everyday lives. By collaborating with Intel we can provide low-cost, full-featured PCs and Internet access to 300,000 teachers who could not otherwise afford it." Noting that the digital divide is not limited to the developing world, Otellini highlighted the work of Vanessa Jones, a senior trainer in the Intel Teach to the Future program, from the Austin Independent School District. Jones has trained 426 "master teachers" who have in turn trained 4600 teachers and influenced more than 100,000 students nationwide. Also keynoting at the conference was Louis Burns, vice president and general manager of Intel's Digital Health Group. Burns spoke of some of the biggest healthcare issues the world faces today and how information technology can address them. Intel formed the Digital Health Group last year to apply its technology and knowledge to enable better healthcare at a lower cost. As with Intel's platforms for the developing world, in healthcare Intel pursues a people-centered innovation process to meet the most important needs and desires of individuals and organizations. TechRestore offers a $25 discount to The 'Book Review readers off any PowerBook or iBook in stock. Just enter the code CWM during checkout when ordering online. The coupon code is valid from now through 2007.12.31. For more deals on current or recently discontinued models, see our best 15" MacBook Pro deals, our best 17" MacBook Pro deals, 12" PowerBook G4 deals, 15" aluminum PowerBook G4 deals, 17" PowerBook G4 deals, titanium PowerBook G4 deals, iBook G4 deals, PowerBook G3/deals, and white iBook G3/deals.